I'd like to receive info and giveaways from Chefs Catalog. Note: You can enter this giveaway two (2) times per e-mail address per day. Deadline is 11:59PM ET 5.31.19. This giveaway is offered in partnership with CHEFS Catalog. Visit their site for a complete range of brands of cooking and kitchen items. If we’re going to add another appliance to our countertop, it had better earn its keep. The Cuisinart Griddler has nothing to worry about. It’s a multi-tasker that we can use for breakfast, lunch and dinner. How many other appliances can dish up Sausage Sandwiches, Grilled Cheese Croutons and Pancakes? 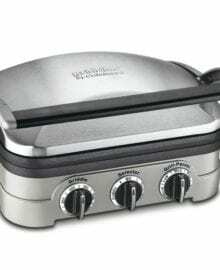 The Griddler Deluxe can act as a grill, griddle, or panini press. It’s such a convenient alternative for those times when you don’t feel like firing up your outdoor grill. When you’re finished cooking, put the removable cooking plates in the dishwasher, sit back and relax. But why take our word for it? View the full list of product features and reviews, to realize the incredible value of this versatile, indispensable piece of kitchen equipment. NO PURCHASE NECESSARY TO ENTER OR WIN. Void where prohibited by law. Open to legal residents of the 50 U.S., D.C. and Canada (excluding Quebec) who are at least eighteen years old at the time of entry and have internet access. Begins on 4.5.19 at 12:00:00 a.m. ET and ends on 5.31.19 at 11:59:59 p.m. ET. To enter the giveaway, submit your full name and email address on this form. Odds of winning this giveaway depend on the total number of eligible entries received. Only two (2) entries per email address per day. Sponsored by Leite’s Culinaria, Inc. For more information, visit our Official Rules. Be sure to add giveaways@leitesculinaria.com to ensure notification if you are the winner.